This .357 SIG version of Speer’s highly popular Gold Dot line has found favor with many law enforcement agents and concealed carriers. 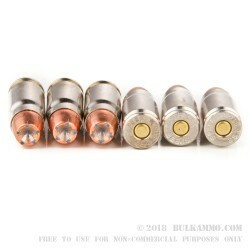 The round lives up to the .357 SIG’s reputation for power, firing a 125-grain Gold Dot jacketed hollow point at a blistering 1350 feet per second and delivering a staggering 506 foot-pounds of energy at the muzzle. 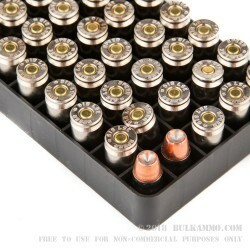 Unlike many self-defense rounds, Gold Dots are available in 50-round boxes to facilitate bulk buying by law enforcement and citizens. With Gold Dots, there’s no excuse not to test your self defense ammo before you start carrying it! . 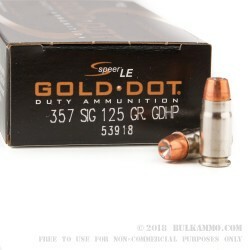 However, the standout feature of this cartridge is the Gold Dot bullet itself. Designed to prevent core-jacket separation, the Gold Dot features a proprietary bonded design that consistently offers maximum performance against targets. Due to the nature of the production process, Speer designers possess the ability to heavily optimize Gold Dot bullets for each caliber and weight; thus, this loading is engineered specifically to take advantage of the high velocities and power of the .357 SIG cartridge. Speer is a well-known Idaho designer and manufacturer of both bullets and loaded ammo. Founded in 1944, the company has achieved very strong market share in the self-defense and police markets due to the superlative quality and reasonable cost of its Gold Dot personal protection and Lawman range ammunition.